Black Diamond Nitron Carabiner. Black Diamond's hot-forged keylock carabiner with an ergonomic, hot-forged gate. 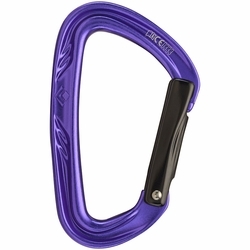 A multi-purpose, 100% hot-forged biner (including the ergonomic gate), the Black Diamond Nitron Straight carabiner provides smooth-clipping keylock functionality for everything from racking Stoppers to clipping bolts and the Nitron Bent carabiner provides snag-free keylock functionality and smooth, fast clipping when it matters most.